The Aztecs were strongly influenced by a culture that rose to power in the Valley of Mexico. This culture was called Toltec, and they rose to power after the collapse of Teotihuacan. The Toltec were masters of architecture, art, medicine, engineering, and calendrics. They were deeply religious, and deeply devoted to human sacrifice. Their capital was called Tula or Tollan, and it was located in the state of Hildalgo approximately 60 miles north of Mexico City. Here, using masonry, and precision craftsmanship, they built homes, temples, and palaces. The Toltec acquired skills from other cultures, especially the descendants of the Teotihuacan. They cast objects out of metal, made writing paper, wove textiles of colored cotton, and were remarkable in both architecture and astronomy. The finest example of Toltec architecture is the temple that is called Star of Venus or Tlahuizcalpantecutli. This temple features gigantic carved idols called atlantes. The atlantes stand 15 feet, and they once supported the roof. They are examples of some of the finest stone craftsmanship in all of the ancient cultures. Toltec ceramics were also developed to a high level. Some of the ceramic styles are also believed to be inherited from the Teotihuacan culture. The Toltec were so respected that virtually every tribe in the region claimed Toltec ancestry. The Toltec arrived in the Valley of Mexico just prior to 900 AD. They were led by a very powerful king named Mixcoatl. Before long, the Toltec defeated the Lobotomist and gained control over the entire area. According to legend, during the wars of conquest, in the town of Cuernavaca, Mixcoatl met a woman named Chimalma by whom she bore a son. Mixcoatl was assassinated before the baby could be born. Then, the mother died during childbirth. The boy was named Ce Acatl Topiltzin. Topiltzin was taken in by his grandparents who taught him the religion of his ancestors and the adoration of the god Quetzalcoatl. Later, when Topiltzin had grown, he would retake the lands of his father and establish the city of Tula. Under his rule the Toltec made incredible progress in almost every area. Topiltzin did not like human sacrifice. At first, he tried to restrict it, and eventually he eliminated it altogether. This put him at odds with many of his people of his kingdom, and eventually forced him to leave Tula. Topiltzin and his people would soon arrive in Chichen Itza where they would have remarkable influence. Before long, Chichen Itza would adopt many of the Toltec cultural traits as well as architectural and artistic styles. 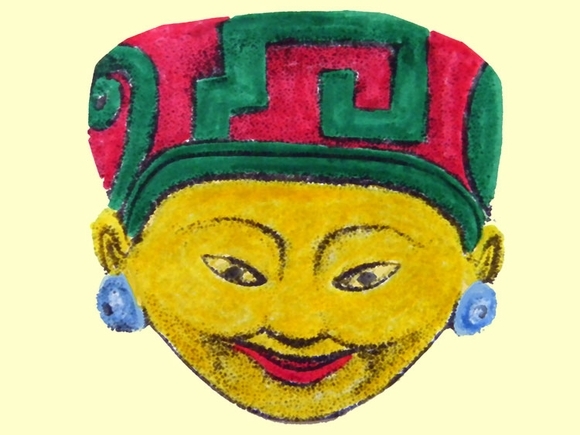 At the same time, Tula would experience a rapid succession of chieftains. This led to a period of cultural decay that was heightened by long periods of drought. By 1156 AD, the last of the Toltec rulers were forced to move out of Tula by invading Nahua tribes. The displaced Toltec moved in all directions, with many of them assimilating into other cultures.